A mere 18 years old, Seattle-native violin virtuoso Simone Porter is already earning an international reputation for her impassioned energy, musical integrity and vibrant sound. 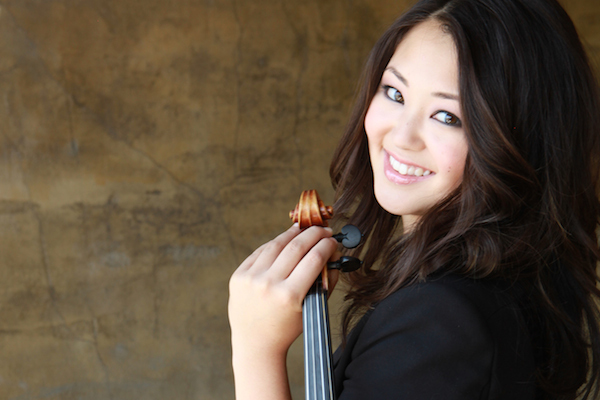 Hear her perform with the Seattle Symphony on May 28, 30 & 31. Tickets and more information. You’ll be playing Mozart's Violin Concerto No. 5 with the Seattle Symphony, but you’ve also been playing Barber, Bruch and Mendelssohn concertos a lot — do you prepare for Mozart differently than the others? Mozart is so delightful to prepare because much of my practicing is experimentation and exploration. All the Mozart Violin Concertos are so operatic, I thoroughly enjoy the challenge and the adventure of searching for the necessary variety of colors in my violin, trying to tease an entire opera cast out of this one instrument. From when your morning alarm goes off to when you crash at night, what is your routine on the day of a performance? Ideally I wake up fully refreshed — it’s nice that getting a full night’s sleep is a work requirement. I’ll spend the morning practicing or rehearsing with the orchestra. Throughout the day, I aim to preserve energy so that my battery is fully charged when I walk on stage. I usually arrive at the hall about an hour in advance to warm-up/glam-up backstage. My behavior after the concert is dependent on the quality of my performance — whether I’m celebrating or moping, chocolate of some kind is usually involved. I recently gained access to the Berlin Philharmonic’s digital concert hall, so I’ve been making my way through the impressive archives housed there. Favorites: Simon Rattle conducts Mozart Symphonies Nos. 39, 40 and 41, and Lisa Batiashvili performing Prokofiev’s Violin Concerto No. 1. Non-classical: My Spotify playlists are currently full of Snarky Puppy and Punch Brothers. Do you have a favorite place in Seattle that you think nobody else knows about, but should? I’m afraid to say that I have no exciting hidden places in Seattle — my favorites are all oldies but goodies: Elliot Bay Book Company, the Molly Moon’s next door (I think about the salted caramel ice cream all year when I’m away from Seattle), the Burke-Gilman Trail, the Fremont Troll….